I'm excited to share with you a brand new shop! 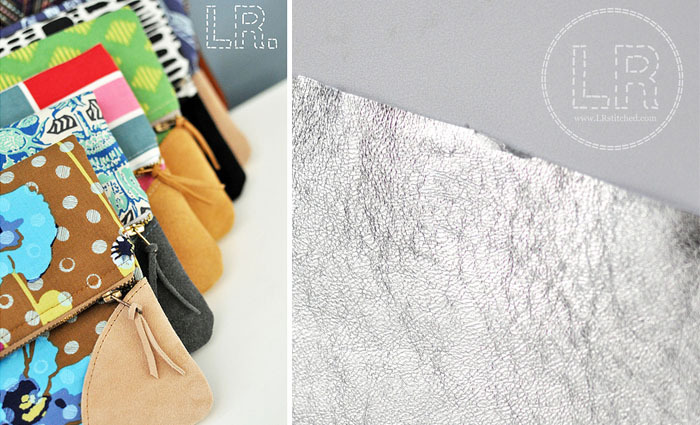 Lindsey of LRstitched is now offering leather and suede pieces which are perfect for bag making. Not only can you purchase 8 x 12 inch pieces of suede or leather in various colors; but she also carries scrap packs made specifically for my leather accent fold over pouch pdf pattern. For only $4, you'll get enough leather to add suede corners to your pouch. It can be hard to find quality leather/suede locally so I'm so glad that there is now a great online option for those wanting to make the pouch or any other project requiring leather. 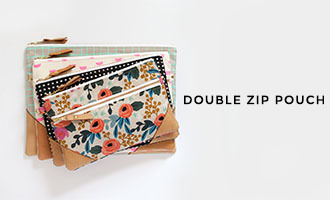 You'll also find zipper pull scrap packs as well as the awesome Luxe Tote pattern + coordinating pre-cut leather kits. How about a giveaway? Lindsey is offering up an 8 x 12 leather or suede piece (winner's choice and metallic is included) to two lucky winners! The giveaway is open to all readers. Leave a comment below sharing what you'd make with suede or leather! I agree! the foldover clutch! Or maybe a wallet . .. I would make a clutch or a large pouch. Or maybe an ipad case...I can't decide! Also, loving the metallic gold. I would make another fold over pouch. I just made my first one but could only find pleather. I'd like to sew with some suede next time! I am definitely getting that luxe tote pattern! Oooo... I would make my husband a case for his ipad! Thank you for this giveaway! I would love to make a fold over pouch! Thanks for the giveaway! I would make one of your awesome fold over pouches. Sweet give away! Now that I have my Janome 1600P I've been branching to leather and top quality vinyl. This is very nice of you! I am loving that fold-over clutch. So gorgeous. I'd have to give making that a whirl. Thanks!. What a great idea - I love the leather accent fold over pouch! That silvery leather is so fun. I'd probably pick one of the tans for a bag though, it's just more my style. Thanks for the chance! Woo hoo! I was just standing in Joann Fabrics today feeling frustrated that it's so tough to find decent leather, so this would be an awesome treat. I'd use the leather to add details to a tote I'm working on. I would love to make a fold over pouch or two to give as christmas gifts. Definitely a fold over clutch! The metallics are amazing. I would definitely make a clutch with the leather. I love the metallic, I could do so much with that. Thanks for the giveaway! I would make a pencil pouch for my grandson. The leather corners would made the pouch sturdy and add life to it. I would like to make the fold over clutch and a matching key fob! Fold over clutch! Love the metallic colors! I've never sewn with leather or suede before, so I would probably start off with the fold over clutch pattern. Its so cute - a great accessory for that upcoming fall date night! oh I would totally make your pouch with Lindsey's leather! I would love to make the foldover clutch, or maybe a small leather zip pouch to use as an id holder. Thanks for the chance! I have to use a walker to walk or stand, and I hate it. I might use the leather to make a bag to use with it to make it look a little less "old lady!" Thanks for the chance! I'd definitely use the leather as accents on some sort of bag/handbag! I would certainly try the fold-over clutch to begin with! Who knows what may follow! I would definitely make the fold-over pouch! I've been wanting to try it forever! I need to make that clutch, NOW! I love the fold over clutch! It's beautiful and we have no local leather suppliers here so this is a fabulous opportunity! I would make that lovely fold over clutch! Thank you for the chance to win. I love the feel of leather! I would use it to make a metallic leather purse! I would definitely make the fold over clutch. I could really use that for the upcoming holidays! Oh it would have to be this clutch or the tweedy one from Zakka Style for sure! Yum!! I think I would like to make that tote bag as shown above - yum!!! The foldover clutch!! A cute and quick design - Thanks for the very generous giveaway. This looks like a great pattern and a great look too. I would make a bag with leather accents. I'd love to try the metallic! I would also make the fold over clutch, thanks! the fold over clutch is a perfect pattern! I'd love to make it... I've also wanted to make a journal cover with leather accents! I want to try my hand at those cute baby moccasins. The fold over clutch looks like a super accessory! And the leather accents make it even more special! I think I need to make lots of these! I would make the clutch! It is very cute. Thanks! I'd love to use leather on a new purse! I love your clutch, the luxe tote, and that amazing leather accented weekender lindsey made! I would make the fold over pouch first! Fun! count me in! I'd love to make your pouch!!! Definitely the fold over clutch. Love it. 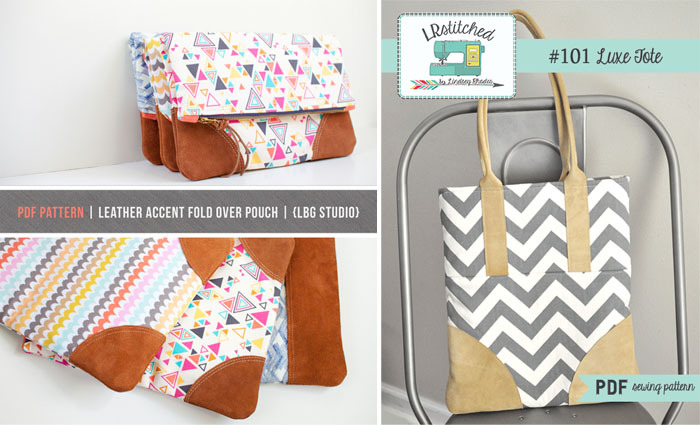 The fold over clutch is awesome - I even have the perfect fabric I've been hoarding! Thanks for the give away! Maybe a leather case for my iPhone?! I so want to win this and make a one-of-a-kind leather purse. Thanks for the chance to win it! Thanks for the chance! I've never sewed with leather before! Ooh a holiday fold over clutch with the metallics would be amazing. Thanks for the giveaway! I'd make the fold over clutch. So cute! I've been dying to make this clutch. Thanks for the giveaway. I would def make the leather fold over clutch!!! So cute! I could away use more leather and a pattern. I absolutely adore the Luxe Tote! 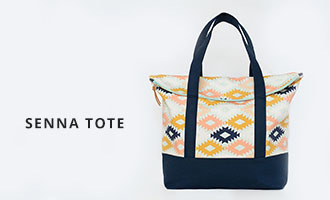 I'd definitely love to sew this tote. Thanks for the fun giveaway! I would love to make some jewelry and some bags to give as Christmas gifts! i bought the sew fab bundle and the little clutch would be really cute with the leather corners like you've done and the little cross bar/handle in leather. With any leftovers, I'd make a tiny leather zip pouch for coins. I lovelovelove coin pouches! Oh wow, for the suede I so want to add some professor-looking elbow patches to my son's sweaters! For the leather, I'd love to cut the scraps into jewelry. And I'd also love to make a small coin pouch with one of the exterior sides in suede or leather. Thank you so so much for sharing this resource!! I would love to make a new bag with leather corners. I keep seeing posts like this and it looks fun. I would definitely make something for my 2 daughters. Perhaps a wristlet to hold their cellphones and a few other miscellaneous items? I like this clutch, but I could also see using leather as an accent on a journal or kindle cover.